How are things this lovely Hump Day ?? This is a waaaaaayyyy Loooong Week -- and Geek Squad is still struggling with my laptop - yikes! I meet with them this afternoon to discuss retrieval of the information from my now defunct hard drive. The news so far has not been good!! We're going to attempt to use the "system restore" back up from February 2nd; which means if all goes well, I will not have lost quite "everything!" in my life!! LOL Sigh -- I do so hate computers!! We have waited an awful long time for some rectangle framelits. Stampin' Up! is a little bit behind on this one, getting beat out by several years now by companies like My Favorite Things and Simon Says Stamp (as examples). So you can imagine how excited we all were to see this gorgeous set of framelits introduced in the new Spring Occasions catalog. These framelits are absolutely fabulous ~ and a must have for your collection. These framelits are pretty special - and I want to show you why! When you look closely at your framelit - and pay attention to how it is going to cut your paper, you're going to notice 2 things. First, you will notice that there is "stitching" in two rows. These rows are separated by a "straight edge" - which is a cutting edge. So my second point with this framelit is this ~~ when you cut your rectangle(s) you will leave an opening in your cardstock that shows a stitched edge around the outside; AND you will get the "cutout" that also has a stitched edge around the outside edge. That makes this framelit "dual purpose"!! How absolutely fantastic is that!! So now for the "pièce de ré·sis·tance" ~~ Here are the inside cutting measurement of each of the rectangles in the Rectangles Stitched Framelits Die set! This will help you when you are planning for different designs on your cards! I love having these kinds of "cheat sheets" close at hand! This "amazing" die set it bundled with a just as "amazing" stamp set called Amazing Life - I really love the bold fonts of this stamp set - and its versatility. Even better! The bundle price qualifies you for a FREE Sale-A-Bration product!! SNAP it up and take advantage today!! Terrific Tuesdays ~ Perfect Coordination! We've been playing with all sorts of goodies from Stampin' Up!, and just can't get enough of the Sale-A-Bration fun this year!! I am so excited about the new dies, punch and stamp set, released as "coordination" items beginning March 1st, to go with all your wonderful FREE Sale-A-Bration products this year. What a wonderful surprise! So snap up your Sale-A-Bration Freebies . . . and then get ready to purchase all the new "coordination" items to go with them on March 1st. Let's walk thru all the wonderful Sale-A-Bration promotions and details and keep you "caught up" with all the goings on!! Sale-A-Bration has been so popular this year, that demand has exceeded expectations on some products. Three of our most popular products are now sold out and no longer available - the Grapefruit Grove/Lovely Lipstick Foil, Butterfly Elements & Precious Parcel Card kit are all gone for 2019. But there are still some wonderful items from our First Release still available!! The second release of Sale-A-Bration products occurred on February 15th and are a Wonderful! supplement to the first round of products, giving you so additional wonderful new options to choose from!! I adore all of these new products. Hurry! Get your qualifying orders in and snap these wonderful items up for yourself! The exciting announcement of 2019 are the Brand New "Coordination" items being released to coordinate with your Sale-A-Bration products!! If you are in love with your new Sale-A-Bration stamp sets, but somethings think to yourself that you wish . . . gosh, I wish there was a matching set of framelits to go with this set . . . Well, here is your Fairy Godmother to grant you your wish!! There is also a new "sentiment" stamp set being released that will give even more sentiment options to go with your SAB sets! Like . . . for example . . . these will be perfect to go with your So Hoppy Together stamp set: "Thanks for Hopping By", "Jumping In", and "Leaping for Joy is Easy to Do." In addition, there's a brand new "Label" Punch - that you are absolutely going go adore!! All products above are only available WHILE SUPPLIES LAST. Get All the Details for SAB HERE. Did You Hear!! Paper Pumpkin is having a Birthday!!!!! 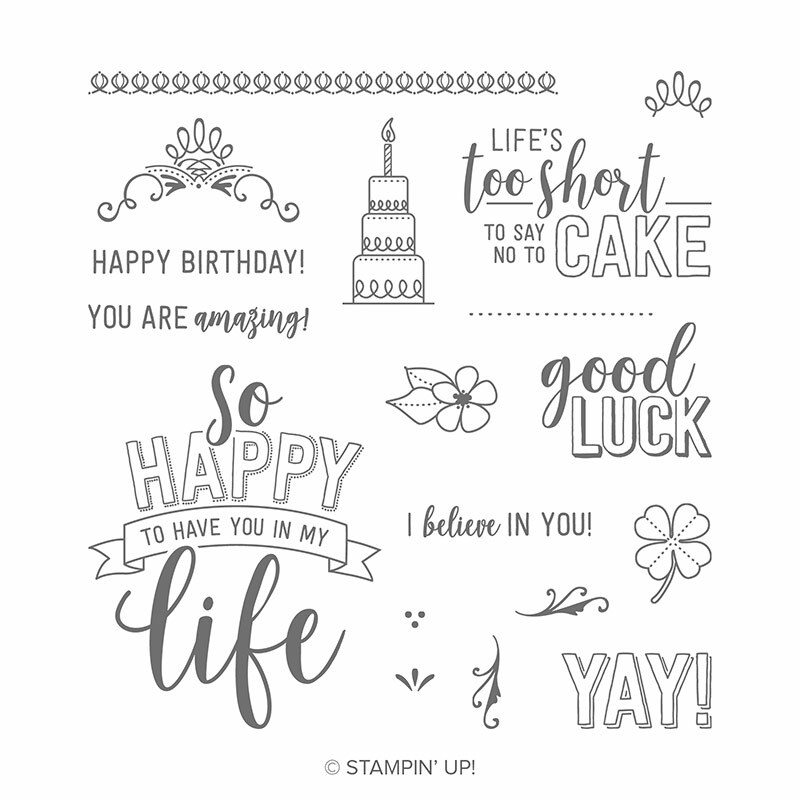 To celebrate Paper Pumpkin's 6th Birthday, and to thank all you wonderful subscribers who support Paper Pumpkin month after month, Stampin' Up! is offering a specially designed March Kit and a FREE Stamp Set!! Oh yes! You read that correctly! In March, you will receive TWO Stamp sets in your Paper Pumpkin kit!. To subscribe to the monthly Paper Pumpkin kit click HERE. And if you purchase a prepaid subscription you earn a FREE Sale-A-Bration item with that too!! Please Feel Free to Contact Me with Any Questions !! It's February 15th (the day AFTER Valentine's - LOL), and today is the 2nd Release of Sale-A-Bration for 2019. Sale-A-Bration (Jan. 3 – March 31) is one of the biggest Stampin’ Up! promotions of the year. Earn FREE product gifts for every $50 or $100 (total before shipping and tax) you spend. I love how many of the gifts coordinate with Occasions Catalog and Sale-A-Bration coordination limited release products.